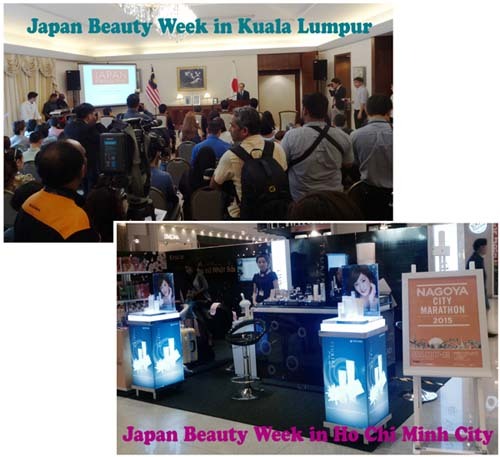 Japan Beauty Week in Kuala Lumpur and Ho Chi Minh. Menard participated in 'Japan Beauty Week in Kuala Lumpur' and 'Japan Beauty Week in Ho Chi Minh' in January, 2015. These events were held by the Ministry of Economy, Trade and Industry in order to advertise Japanese cosmetics to overseas. In Malaysia, this event was held at the residence of the Japanese ambassador on January 20. Five cosmetics companies including Shiseido and Kose participated in this event. Japan Cosmetic Industry Association held a seminar and all companies showcased Japanese cosmetics showcase at their booths. Menard introduced Authent line and got a favorable reception. In Ho Chi Minh, Nine companies including Kanebo and Kose participated in this event from January 22 to 25. Menard and other five companies held a seminar at the Japanese consulate on 22. All companies prepared a booth at Aeon mall, one of the famous shopping mall in Ho Chi Minh from 23 to 25. Menard introduced new MTBA, a device for checking a skin condition at the booth for the first time in Viet Nam. This event was a great opportunity for many people in Malaysia and Viet Nam to know about Menard Cosmetics.